Zynga‘s just revealed its latest tool to sucker you in to spending hours “casual gaming” on Facebook: FrontierVille–a revamped, updated version of its FarmVille app. But is this really a reminder of how fickle the casual gaming biz is? Over at Venturebeat they’re labeling FrontierVille as the most “elaborate” title from Zynga yet. It’ll be extremely familiar to the millions of players of the older FarmVille title, and is essentially the same core game set in a different context. Your farm is now a “homestead” and your objectives include growing enough crops to feed your family and keeping your livestock from wandering off, and eventually growing into a frontier town. 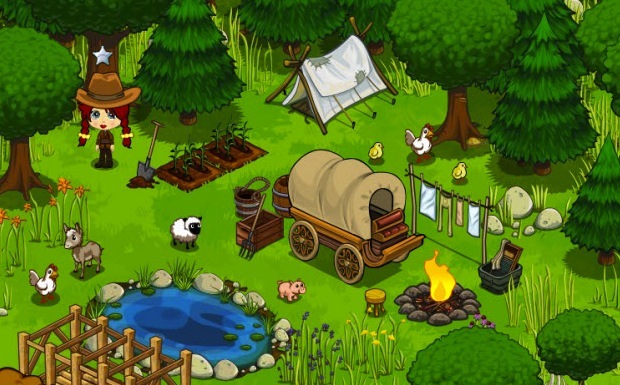 Unlike FarmVille, the game is extremely social, and you can actually tend your friends’ fields for them–and the technology of the game code intelligence has been improved so that more “natural” events occur. For instance, trees grow large from little saplings and bears can attack your farm. These changes are probably the influence of chief designer Brian Reynolds, whose previous experience includes heavyweight game titles such as Civilization. The real driver of the new game is to reverse a slide in Zynga’s fortunes on Facebook. With FarmVille in its portfolio, it was the largest social app publisher on Facebook, but its active user count has slipped by tens of millions in the last several months. The announcement of the FarmVille app for iPhone was even greeted by boos at the WWDC Apple keynote address on Monday–these games are facing an increasingly rough ride in the press. Zynga is by no means in trouble, but the fact it’s scrambling to turn around its falling user numbers quite definitely highlights one thing: The casual gaming genre is fickle and fragile. Like the viral videos its business model somewhat echoes, casual games like FarmVille live and die on the whim of a popular trend. People play, get bored, and move on to something new. FrontierVille is indeed something new, but it’s not differentiated enough from the original product to keep the public amused for long–my feeling is that in its next game iteration, Zynga needs to try something radically different to recapture that viral “play this fab new thing!” feeling.